There’s no better time like the present to roll up your sleeves and find out how you can complete home improvement projects and repairs yourself. All you need is a plan and the right tools for each job. Besides taking care of nagging repairs like a leaky faucet, you’ll increase the beauty of your home with fast and easy in-home repairs, like refurbishing your doors. Interior doors are usually made from wood and can be susceptible to seasonal changes in climate, which can cause squeaks or sticking. They also can be scratched from usual wear and tear. Inspect the hinges for deterioration or loose screws. If hinges look oxidized, add a lubricant to alleviate squeaks; work the lubricant into the hinge by opening and closing the door after application. If the hinges are caked with old lubricant or dirt, tap out the pins with a hammer and screwdriver and clean with steel wool, then clean the pinholes with a small circular wire brush. Remember to place a shim under the door for support. If screws are loose, place a wedge on the latch-end of the door for weight balance before tightening with a screwdriver. If that spot is at the top or on the handle end, you can plane the door without taking it off its hinges. If the tight spot is on the hinge end or at the bottom, take the door off its hinges and set it on its side to plane. Inspect the door surface for scratches. Fill any scratches with door filler, such as a pencil, crayon or felt-tip pen-type product found at many local hardware stores. 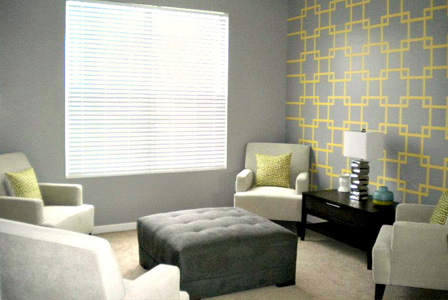 Find the shade that most closely matches your door and rub it into the scratch. Exterior doors are made from wood or metal and are usually exposed to the elements. After years of wind, sun, heat and precipitation, your front door and all its hardware may need an upgrade. Inspect the door, hinges and hardware for damage, wear and tear. If repair is required, take the door off its hinges and remove the hardware. Place the door on saw horses and lay down drop cloths. Strip off old paint. 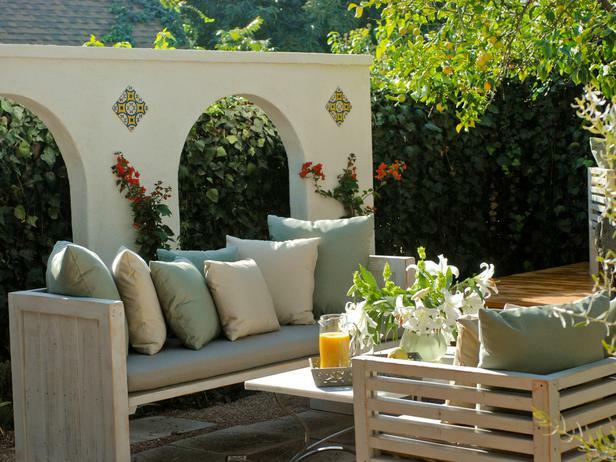 While latex paint may need a chemical paint stripper for this job (work outdoors or make sure you work indoors with adequate ventilation), most paint can be removed using putty knives, paint scrapers, sandpaper and a hand-held sander or belt sander. If you want to finish the door as natural wood, remove all the paint, sand thoroughly and apply a natural product like mineral oil. If you’re re-painting the door, sand roughly until the door is smooth and ready for paint, removing all dust from the surface. Be sure to stay tuned for two more posts similar to this one, part of our 3-part in-home repair series! And for questions or comments concerning this post, contact us or use the comment section below. Happy door maintaining! Are you planning to host a huge Super Bowl party at your place this year? How about a Valentine’s Day soiree, February book club or a group binge-watch of Downton Abbey? If so, would you like to spruce up your floors first? Well, here’s the good news – you have more than enough time to refinish your floors and even install new flooring. If you start the project now that is…and, we can help! To install a new floor you’re most likely looking at a weekend project. Add at least a week to the weekend project if you’re refinishing a floor. However, most of the equipment and materials you’ll need to get the job done efficiently are not stored in your garage. Tools like floor strippers, sanders, polishers, laminate floor staplers, tapping blocks or wood saws are available for rent, while a vacuum, hammers and a pry bar can come from your toolbox. You’ll probably want to spend a little time choosing laminate wood flooring and the foam cushioning recommended for the type of laminate floor that gets installed underneath. Then you’ll want to buy wood glue, sand paper, polyurethane finish, plywood and spacers from your local hardware store. Once you get it all home, each project requires a bit of demo work before application, from removing all furniture from the room to sanding or buffing existing wood floors, to prying up old carpet, baseboards and flooring. Installing a “floating” floor, which is not directly attached to the subfloor, but uses padding in between, cuts down the sound and compensates for any irregularities in the floor. After all the old material is stripped away, make sure what’s left is level with the floor in the adjoining room. Cut new plywood to size, then secure in place with wood glue and nails. Position a layer of foam padding on the plywood. Place the first row of floorboards against the wall with the grooved side to the outside, putting spacers between the boards and the wall, which allows for the wood to expand. Cut the floorboards to size as needed. Fit each board tightly together by tapping each board into place using a hammer and tapping block. Move out from the wall, fitting boards and tapping them into place until the entire floor is covered. 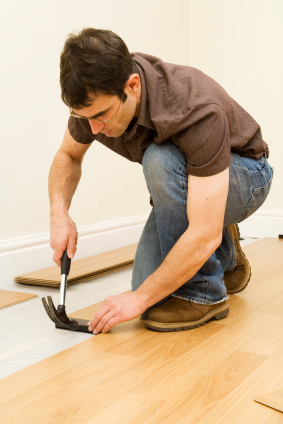 Once the new wood flooring is in place, remove spacers. Replace the baseboard molding, covering the gap between floor and walls. Clean the floor with a hardwood floor cleaner or mix your own (10 parts water to 1 part white vinegar). Wipe down the floor with a soft cloth. Hand sand any parts a buffer can’t reach, such as the perimeter of the room, with 180-grit sandpaper. Rub with the grain about five inches out from the baseboard, until the finish dulls. Put on a dust mask and lightly sand the rest of the floor with a buffer/polisher, sander or stripper in the direction of the grain, making sure to keep the machine moving at all times, covering every area. Let the dust settle for about 15 minutes, then vacuum it up using a soft-bottomed attachment, following each strip of flooring, then sweeping across them to get any powder that settled between the boards. 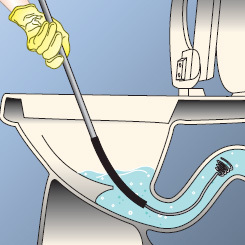 After vacuuming, use a microfiber cloth to wipe the floor a final time, along the grain. Now you’re ready to refinish the floor by applying a fresh coat of finish. If you use a water-based polyurethane, you can apply a second coat in about three hours. 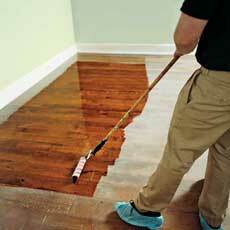 If using an oil-based polyurethane, you’ll have to wait about eight hours for each coat to dry before adding another. Instead of using the finish straight from the packaging, it’s a good idea to remove any impurities by straining the finish through a cone filter into a clean plastic container before application. Also, cover your shoes with booties and your nose and mouth with a respirator. Once a section of finish begins to dry, lap marks will appear. To guarantee a line-less finish, pour only as much finish as you can spread in a 10-minute time frame. 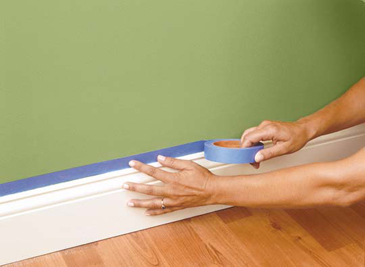 Starting for a point that’s farthest from the exit door, brush a 3-inch-wide stripe beside the baseboard. Next, pour a 1-inch-wide stripe of finish in line with the wood grain. 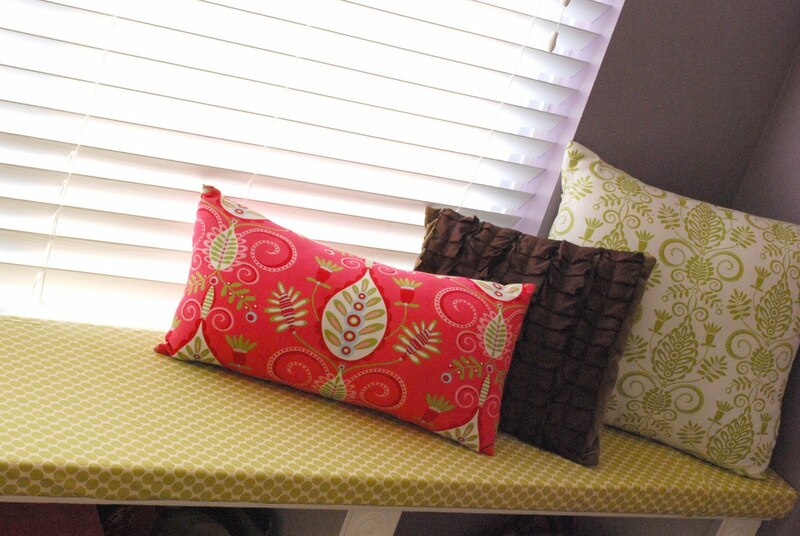 Using a long-handled roller with a ¼-inch nap cover, roll out the finish with the grain, then across it. Working quickly to keep a wet edge, overlap the finish with each pass, for 10 minutes. After the 10 minutes, brush more finish along the edge, then pour and roll for 10 more minutes until the floor is covered. Wait three hours before adding a second coat of finish. Wait about a week before replacing furniture. 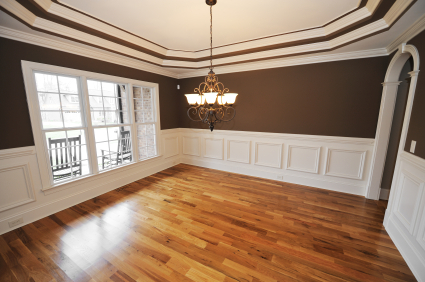 To keep your floor looking as good as new, experts recommend a fresh coat of finish every two years. We carry a wide variety of the tools needed for installing or refinishing wood floors. If you have any questions about what to choose, pricing or how-tos, don’t hesitate to contact us. With freezing temperatures, inevitably your sidewalks, porch and outdoor steps are bound to be slippery and icy. However, a simple and inexpensive solution for ensuring your outdoor walkways are safe comes in an easy-to-carry bag. 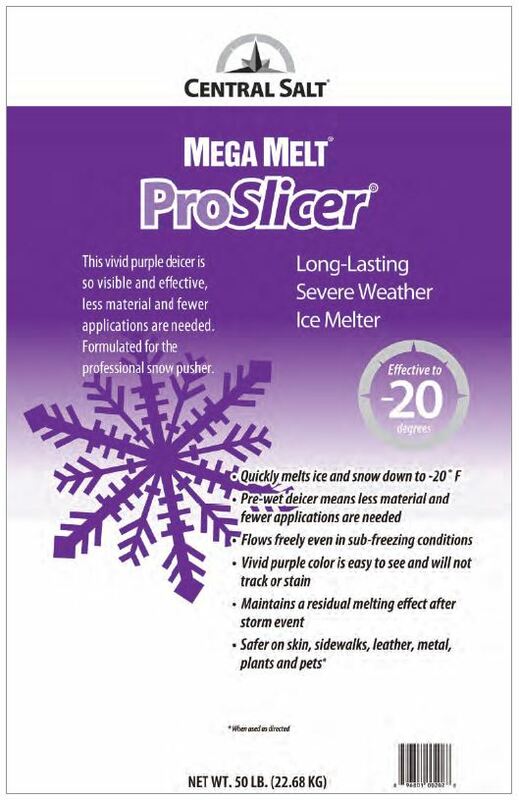 Ice melt is an obvious choice for preventing slips and falls during this rough winter season. Read on to learn more about its advantages and how to best use it. In this post, we’ll explore the benefits of using ice melt. Ouch! Winter weather hazards such as icy, snowy steps, sidewalks and driveways can make it almost impossible to walk around outside without slips and falls. That’s where ice melt can help. Deicers attract offending moisture, forming a briny substance that melts faster than the surrounding ice and snow, thereby clearing potentially dangerous walking conditions with ease. Traditional ice melts are made from rock salt, and start to melt ice at about 5°F. Many of the new-fangled ice melts actually blend rock salt with other chemicals, lowering melt temps to the max, and work even better than traditional rock salt in extreme conditions. 1. Choose Effectively: Save time and money while reducing environmental impact by choosing the right ice melt for the job. Ice melts are made from a blend of materials such as calcium chloride, sodium chloride, potassium chloride, magnesium chloride and urea. Each works best in different temperatures. 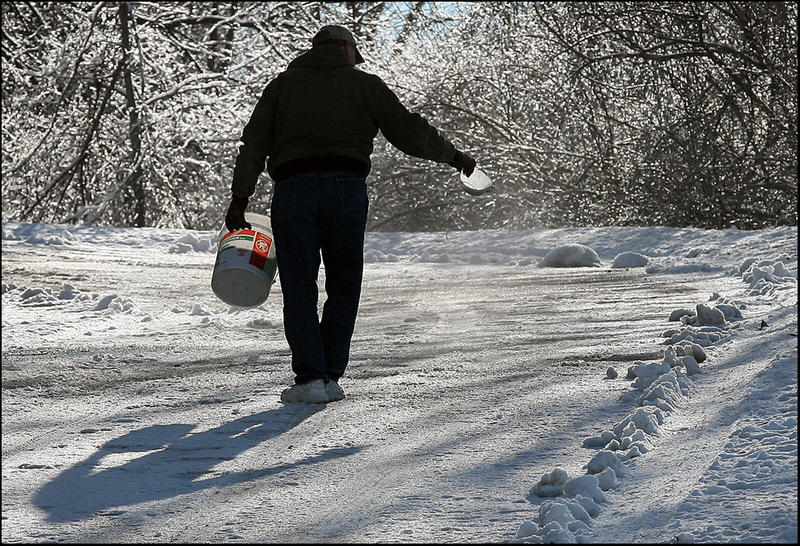 When temps drop below 5°F, ice melts that contain calcium chloride are best for clearing thick ice and snow quickly. In winter conditions above 5°F, choose a melt that contains an ingredient like urea or potassium, which get the job done effectively. Not to mention, they are safer for people, plants and pets. If you’re worried about the effects ice melt could have on your pets, choose one that is free of chlorides. 2. Apply Early: Before snow and ice accumulates, prevent them from bonding with the pavement, by making it easier to remove. Use ice melt for a major weather event, but also for light snowfalls, which can cause slippery conditions especially if the moisture re-freezes later in the day. 3. 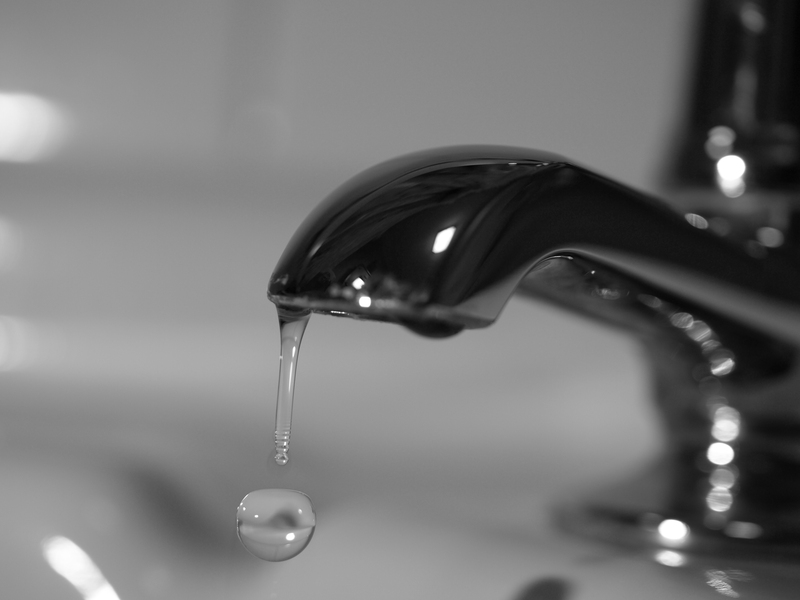 Use Wisely: Use ice melts only on properly formulated, cured, air-entrained concrete that is at least one year old. Brick and other materials are porous and should not be treated with ice melt. Less is usually more when it comes to applying ice melt, because using too much can burn the grass under the snow, or get tracked into the house, potentially damaging rugs and floors. Follow manufacturer recommendations on quantities and application. Once you know which ice melt to buy and how to use it, you’ll be all set for whatever this chilly winter has in store. For more information about the various types available, pricing, or any other questions, as always feel free to contact us or write a comment in the section below. Stay safe out there! With the bone chilling temperatures this year, it isn’t a bad idea to think about investing in one, or even a few, portable heaters for indoor and outdoor use. If the power goes out, or with the wind chill well below freezing, an energy-saving and cost-effective way to ensure heat for you and your family is with portable heaters. Read on for more benefits of portable heaters and other essentials this winter season. In this post, we’ll explore the benefits of using portable heaters. Maybe this is the year you’ll host that fabulous tailgate you’ve always wanted on Super Bowl Sunday – outside, right in the driveway! Or perhaps you really want to fix that old sports car you’ve got in the garage, only you think it’s too cold to work out there in winter. Either way, portable space heaters can keep you warm and comfortable, inside and out. Inside, portable heaters can warm an un-heated room, one that’s not used often or a place where the main heating system needs extra help. In addition, you may save money on your energy bills with zone heating, an alternative to central heating. Instead of heating your whole house, heat only the rooms you spend time in. Space heaters are perfect for this type of heating because they’re portable, they’re generally efficient to run, they’re eco-friendly and they can keep you comfortable. Outside, there’s no reason to freeze your fingers and toes on a cold winter day. Portable heaters can be placed on a patio, a deck or a driveway to heat just that small area you’re using, like zone heating in a house. It’s a great way to get the party started! 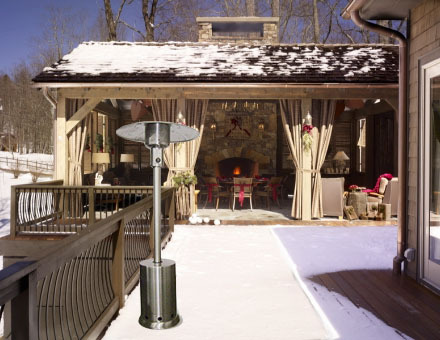 Outdoor and indoor heaters run on electricity, propane, natural gas or kerosene, and work by circulating the air in a room (convection) or by using radiant heat, which warms things directly in its path. Newer models have all of the current safety features, including the Underwriter’s Laboratory (UL) label. Choosing a heater with a thermostat allows you to control the heat and avoid wasting energy. 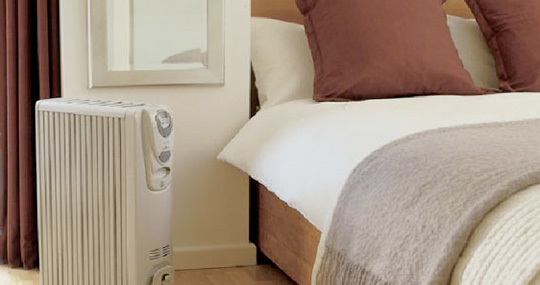 Some heaters come with a tip-over safety switch, which automatically shuts off the heater if the unit is tipped over. Radiant heaters are good choice to heat a room or space for a few hours, and you stay within sight of the heater. Convection heaters that use a heat transfer liquid are ideal for warming a personal space or small room, under desks in the office or in a bedroom. They use no fan, so they’re relatively silent. They’re also easy to maintain because the liquid inside never needs to be replaced. Ceramic heaters use fan-forced air, are compact and good for heating spaces up to 150 square feet, like living rooms or bedrooms. Infrared heaters produce heat quickly, are also quiet and very efficient for warming personal spaces. Then, once you’ve decided which heater/s you need for your home, you know just where to find them. We carry a wide variety with many of these specifications, find them here. Also, if you have any questions about what to choose, pricing, etc., don’t hesitate to contact us. In this post, we’ll explore the benefits of the Snow Blower. 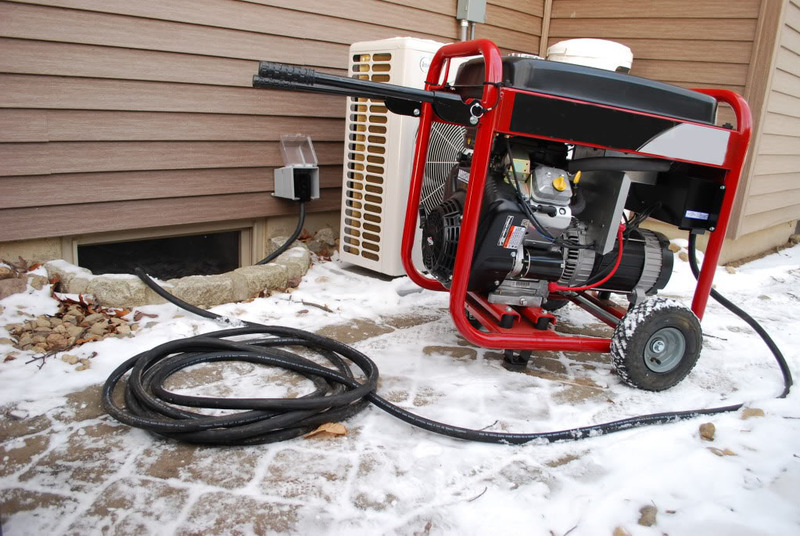 One of several DIY solutions for efficient snow removal, the snow blower, could be one of the most loved power tools in your garage! Why? If shoveling is physically impossible or you’re not going to hire someone else to shovel, using a snow blower can save you a lot of time and sweat equity. Choose the right snow blower for the job. First, you’ve got to identify your “snow removal profile” – how much snow you need to clear from how large an area. Then, take into consideration what the terrain is like and what kind of snow is falling, most of the time. Will you be pushing the snow blower up a slope, or running it right down the driveway in a straight, level line? Is the snow wet, icy, powder or in-between? All of these factors come into play while you’re pondering in the snow blower isle at the store. 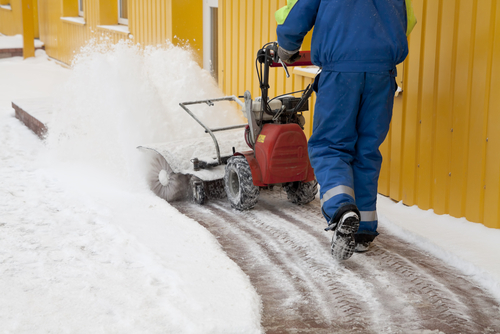 Snow blowers come in three types: single-stage electric, single-stage gas and two-stage gas. More than one of these types may be able to handle your typical snow-clearing job. Electric single-stage models tend to be lighter and more compact that gas units. They start with the push of a button and require an outdoor extension cord to operate. Larger gas-powered single-stage snow blowers on the other hand, are not tethered to a power cord, and typically can clear wider, higher areas. Some two-stage snow blowers have engine-driven wheels that can handle uneven or sloped terrain. The push-propelled models are best for level surfaces. You can also use tire chains with some models for more traction in all conditions. Chances are, you’ll still need to shovel around parked cars and for finishing work. Don’t forget a gas can! Easy-to-use, spill-proof gas cans are ideal to keep on hand for fueling gas-powered tools like snow blowers. In this post, we’ll explore the benefits of the portable generator. A generator’s primary function is to provide electrical energy. For homeowners, portable generators provide emergency power when the power to your house is interrupted, during ice storms, blizzards or an extreme natural disaster like a tornado, hurricane or flood. If you live at the end of the neighborhood power grid or in an area where the power is frequently intermittent, using a generator can help save your tech devices from any power surges, keep your pipes from freezing and food from spoiling – at least for short amount of time. People also use generators for recreational purposes, bringing one along while camping, RVing, tailgating or boating. Generators can be engine-powered, meaning they burn gasoline, diesel or propane to generate electric power, or they can use an inverter that powers the generator from an automobile battery. 1. NOISE LEVEL. A running generator can make a lot of noise. It’s a good idea to check for any noise ordinances or restrictions in your area, especially at night. Most generators are labeled with a decibel rating. For every increase in 10 decibels, the noise level is 10 times more powerful. This means that a generator running at 70 decibels is 10 times as loud as a generator that runs at 60 decibels. However, some generators are built for quiet operation and are perfect for recreational use, so if you’re thinking about using a generator for tailgating, as well as, a source of emergency power, choose a quiet generator. 2. FUEL EFFICIENCY AND RUN TIME. Look for a generator that runs on the least amount of fuel for the longest amount of time. 3. QUALITY OF POWER. To avoid shut down or damage, consistent power output is much more preferable than any fluctuations in output, both for the generator and the appliances being powered. Inverter-type generators are ideal for sensitive electronics, such as computers. Also consider using a generator with voltage regulation that is automatic (AVR), digital (DAVR) or intelligent (iAVR). Runyon carries generators made by Honda with a patented CycloConverter technology that offers the benefits of an AVR-type generator, allowing cleaner power with less weight. Honda Super-Quiet EU generators use inverter technology. 4. SIZE AND EASE OF TRANSPORT. How do you plan on moving a generator and where will you store it? Many times, you’ll benefit from compact, lightweight generators that move easily on wheels. Read the owner’s manual before operating your generator. Always run your generator outside and keep house doors and windows closed. Allow for plenty of space around the generator for proper ventilation. Do not enclose in a box or other casing. Operate the generator under an open, canopy-like structure instead. Avoid using the generator in wet conditions, such as rain or snow, or near a pool or sprinkler system. Place the generator on a firm, level, dry surface. Never use stale or contaminated gasoline or an oil/gas mixture. Follow manufacturer recommendations. Use heavy-duty extension cords that are specifically designed for outdoor use with the generator. Do not plug the generator into a wall outlet, a practice known as “backfeeding.” This is extremely dangerous and presents an electrocution risk to utility workers and neighbors served by the same utility transformer. Run your generator at least once a month, so it’s ready for use when the power goes out. Store your generator upright in a well-ventilated area. The U.S. Consumer Product Safety Commission warns that portable generators can be very hazardous when installed or used improperly. Hazards may include damaged electrical systems, carbon monoxide poisoning, electrocution and fire. If you start to feel sick, dizzy or weak in your home while using a generator, get to fresh air immediately. Do not delay, because carbon monoxide from generators can kill you in minutes. Consider installing battery-operated CO alarms or plug-in CO alarms with battery back-up on every level of your home.